The reason that we need to know the Soil pH is because the pH level of the soil affects the availability of nutrients that plants need. Nutrients must stay soluble in order to be absorbed by plants, acidity causes reactions that can enhance or reduce nutrients' ability to move. The more acidic the soil the easier it is for the plants to absorb, this is mostly a good think but too much acidity can lead to over consumption and toxicity too. The pH of the soil can also make nutrients more difficult to absorb too - alkalinity in soil can lead to deficiency of nutrients in a plant as the plant will not be able to absorb all it requires. Soil pH is a measure of the acidity or the alkalinity of the soil. The best soil pH for plants ranges between 5.5 and 7. However, plants have adapted to thrive in levels outside this range. Both Macro-nutrients and micro-nutrients availability are affected by the soil pH. In some soils if the pH level is out of range the soil can become toxic, for example soils rich in manganese-containing minerals become more soluble as the pH lowers below 5.6 (becomes acidic) this leads to Manganese toxicity symptoms in plants like crinkling or cupping of leaves - this is because Manganese is an essential plant nutrient that the plant draws up from the soil to its leaves, however, like all things in life too much of anything is a bad thing and high acidity in soil brings it to a toxic level. However, if the soil is alkaline this can cause Manganese deficiency in the plant, Manganese is used in chlorophyll production so the plant can't produce the energy and food it requires very efficiently and the plant with gradually die. Iron - a deficiency in iron can make the leaves go yellow. Add one of your soil samples to a test tube filling it 3cm high then top it up with 2cm high of water, put a lid on your test tube and shake well. 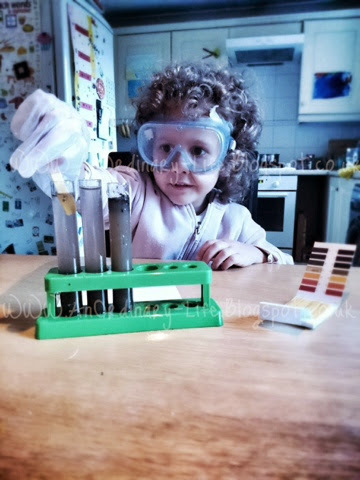 (I added more water for my youngest so it reached higher in the test tube and she could hold on to the pH strip as she didn't want to let it go). Repeat this with the other two soil samples and label them so you remember which soils you are testing. Using this table (click here for the free printable pdf version) write down your soil type and then hypothesise (guess) what pH you think each soil will be. With your goggles on and your gloves on too and put a pH indicator paper into each of your test tubes. It is best just to drop them in. Leave them for at least 5 minutes to settle. 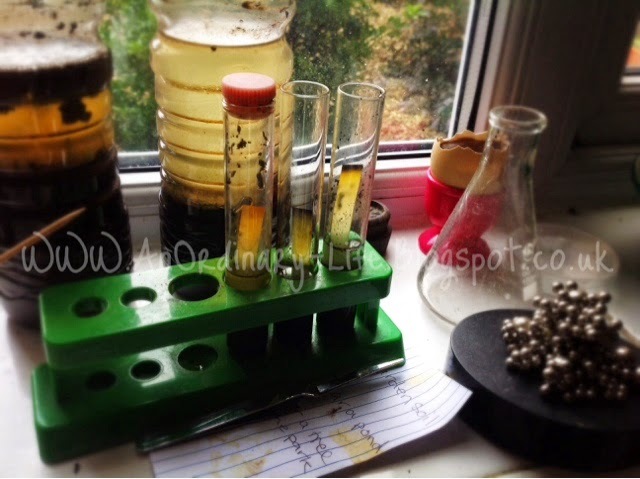 Observe and use your pH chart to work out the pH level of each soil. Write down the results on your table. What did you discover? Were they all the same? The reason we need to know the pH of the soil is so we can balance it out. Limestone is usually used to raise the soil pH as it adds alkalinity to the soil. Sulphur is usually used to lower the soil pH making it more acidic. After this experiment, if you have a soil that is an alkaline, try adding some lime juice and test the soil pH again, does it lower the pH? This is a follow on experiment from the last experiment we did: What is soil made of?